The MAIRA.tie from the CYBEX Gold range offers easy and intuitive adjustment to fit parents of all sizes and allow for comfortable carrying. It also adjusts as baby grows: the ergonomic seating panel adjusts in width and height so you can carry your child from newborn days to toddler years (approx. 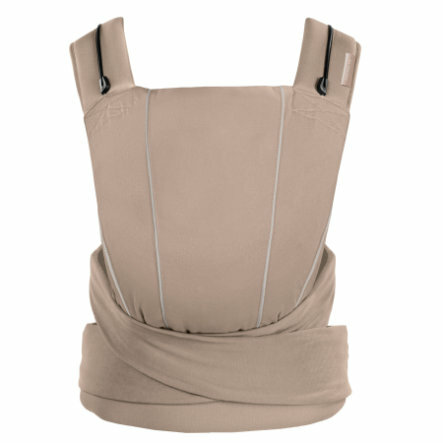 2 years) The carrier’s ergonomic shape and wrap-like fabric support baby’s naturally rounded back. In addition, the extendable, multi-functional headrest and the diagonally elastic fabric offer optimized support for baby’s naturally rounded back. Healthy carrying supports the natural spread-squat position which adjusts to baby’s size and healthy hip development. Comfortable padded shoulder straps with optional cross or parallel wearing (incl. sternum strap).